The contemporary of Johannes Vermeer and Pieter de Hooch, Gerrit Dou was the founder of the so-called fijnschilders (“fine painters”) of his native Leiden, notable for the miniaturistic detail and polished surface of their work. 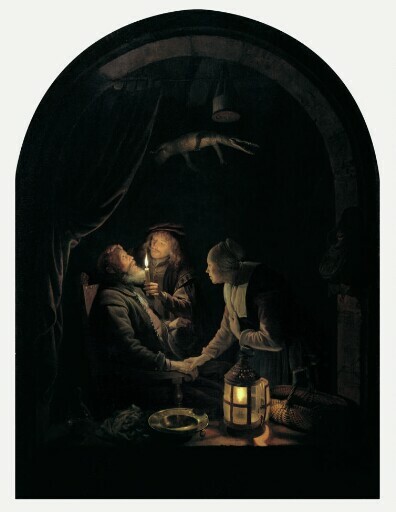 In Dentist by Candlelight, Dou displays his legendary virtuosity in rendering still-life objects, the effects of artificial light, and the nuances of emotional states. The tooth-puller is a frequently depicted subject in Dutch and Flemish art from the seventeenth century. Dou incorporates the familiar components of the scene, including the long-suffering patient and concerned onlooker, here no doubt his wife. Dou’s visual wit is evident as the anxious, open-mouthed patient rolls his eyes upward to see the sharp-toothed crocodile (often displayed on the premises of barber-surgeons) suspended above him. Possibly Mme Hoffmann, Haarlem, by 1827.
purchased by Kimbell Art Foundation, Fort Worth, 2002.